La traducció d'aquesta pàgina encara no està acabada. Fins que ho sigui, algunes part correspondrà a la versió anglesa. Preferències: ~/config/settings/* - Cada traductor gestiona el seu propi fitxer de aquí un cop canvieu les seves per omissió. ~/config/settings/system/DataTranslations settings - Conserva la posició de la finestra del quadre. Every application has the ability to open and save every file format for which there's a Translator installed. 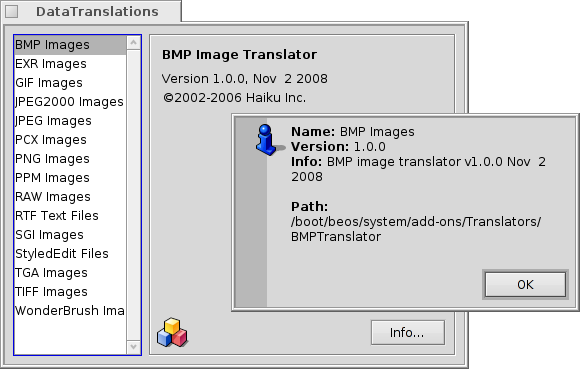 The settings for these Translators are configured in the DataTranslations preferences. Depending on its capabilities, each Translator offers different settings. At least you'll get an Info... button that opens a window with the credits and the installation path. The following table gives an overview of the default Translators and their most useful options. You can reduce the filesize by limiting the number of used colors and the palette. You can write images with transparency, either by automatically using the alpha channel or by setting the RGB value that will be transparent by hand. Here, you normally only care about the output quality. Besides the output quality you can also set a smoothing that will lessen compression artefacts but can blur the picture a little. The translator reduces all layers to one bitmap layer. Screenshots, charts, black&white drawings and other images with few used colors, as well as small pictures are best saved as GIF (up to 256 colors) or PNG (millions of colors). JPEG, for example, introduces compression artefacts without gain in smaller filesize.